In District 34, Republican Sen. Bob Cassilly’s lead over former Del. Mary-Dulany James has narrowed. Yesterday, MDJ trailed Cassilly by 446. After today’s count of provisionals, she now trails by 259. There is still one more round of absentee ballots to count. Meanwhile, in District 34A, Republican Del. Glen Glass now lags 129 votes behind Democrat Steve Johnson. Seems small but several multiples more than his lead yesterday. The counting continues of absentee and provisional ballots. Right now, several elections remain very close. McConkey, an Anne Arundel County Republican, was ordered to pay $75,000 for what an administrative law judge called “fraudulent and unethical” behavior in real estate transactions. In one instance, the state found McConkey promised to help a woman keep her home, then didn’t return her calls, bought her property in foreclosure and sought to evict her. He then sponsored legislation to make it easier for him to get his real estate license back. District 34A (Havre de Grace) remains a nail biter. Incumbent Del. Glen Glass current trails Democrat Steve Johnson by just 19 votes. Del Mary Ann Lisanti appears to have a lock on the second seat. District 34 (Harford) appears to have been a bit of a sleeper in the Senate as well as the House. Four years ago, Democratic Del. Mary-Dulany James sought to move from the House to the Senate, and got caught in the undertow, losing to now Sen. Bob Cassilly by 43% to 57%. James tried a comeback this year. I figured that Cassilly was safe as an ensconced incumbent in tough territory for Democrats. But James sure is doing her best to prove me wrong. She trails Cassilly by 446 votes. Not such an easy catch up in a district where absentee ballots don’t lean especially Democratic but still intriguing. Meanwhile, over in District 9 (Howard/Carroll), Democrat Katie Fry Hester has claimed victory over incumbent Republican Sen. Gail Bates. Hester’s victory has grown to 531 votes as more ballots have been counted. If I’m missing any other close ones, let me know. Part I looked at the relationship between Trump’s share of the vote and Democratic success in Virginia’s state house elections. Today, I look and see what the Virginia results indicate for Maryland Senate races. Using a statistical technique called logit, I estimated the probability of Democratic victories in all 47 districts based on the relationship between the share of the vote won by Trump and election outcomes in Virginia. 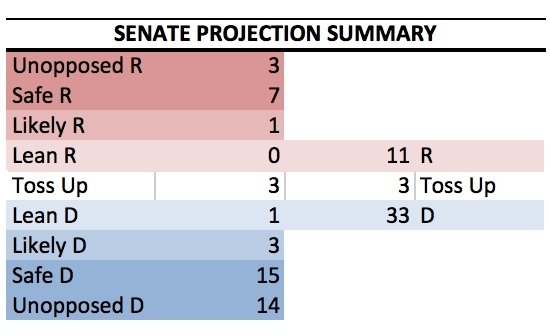 The statistical model suggests that Democrats are most likely to lose 1 or 2 seats in the Senate. A more conservative estimate would be that the Democrats lose 0 to 3 seats. Even a loss of 3 seats would leave Democrats with more than enough to override a Hogan veto should he overcome tough political winds and win reelection. Which seats are most likely to shift? Sen. Jim Mathias defies political gravity in holding Eastern Shore District 38, which gave Trump 61% of the vote – a full 28 points higher than the share received by Clinton. But this former Ocean City Mayor earns it by out hustling his opponents in every way and is a born politician. He beat a delegate in 2014 and will likely face one-term Del. Mary Beth Carozza this year. District 38 has three subdistricts so Carozza has represented just one-third of the district, including Mathias’s home in Ocean City. She has $114K in the bank compared to $250K for Mathias. Senate President Miller spent big to aid Mathias in 2014 and is prepared to do it again. Hogan and the Republicans have also promised to invest large sums, but the big question is whether Hogan will decide he needs to money for himself. Despite in theory being a lock for Republicans, this race is a conundrum. Statistically. Mathias should be a dead duck. But the same was true in 2014. Why should Mathias now lose in 2018, expected to be a good Democratic year? Additionally, my model cannot control for any positive impact of Democratic incumbency. I rate it a toss-up. Individually, Democrats are likely to win each of the seats. None are particularly encouraging for Republicans. Collectively, the model indicates a 60% chance of losing one of these seats. As usual, Republicans plan on going after Sen. Ron Young in Frederick. Good luck with that. The model suggests he is a lock, and this ignores that Frederick has been trending Democratic or that Democrats thumped Republicans in last year’s City of Frederick elections to win control of the mayoralty and city council. Trump lost to Clinton by 8 points in this district. Not going to happen. Similarly, taking down Senate President Mike Miller would be quite a prize for Republicans. The model gives Republicans a 1 percent shot in this district Trump lost by over 5 points. However, it’s virtually impossible to see how the always well-prepared Miller, the longest serving legislative leader in American history, goes down in territory he has won easily for decades. The next three seats have Republicans salivating but the model indicates that they are underdogs in each. Sen. John Astle’s retirement from his Annapolis-based district, after losing the primary for city’s mayoralty, leaves a vacancy. Even so, Republicans have only a 14% shot at picking up this district. Democrats are very pleased with their dynamic and politically experienced candidate, Sarah Elfreth. As in Frederick, Democrats gave Republicans a hiding in the 2017 Annapolis municipal elections. Former Del. Ron George has a clear path to the Republican nomination, as Del. Herb McMillan has given the race a pass. George ran for governor in 2014, losing Anne Arundel to Hogan in the primary by a 2-1 margin. However, George has a bank balance of $169K to $50K for Elfreth. As Trump’s life goal is to be in the headlines, the answer seems clear. Miele has $87K in the bank compared to $194 for Klausmeier, who is well liked in her district but taking nothing for granted. There are rumors that Miele might just run for reelection for delegate. Sen. Jim Brochin is retiring to run for county executive. The most conservative Democrat in the Senate, Brochin had both a tough primary and general last time around. The improved political climate suggests that Democrats have a 72% probability of holding the seat. Del. Chris West (42B) is running for the Republicans. Democrats have two candidates, Robbie Leonard and Gretchen Manavel. Sources tell me Leonard, a former county party chair, has the advantage with local activists but that Manavel has money and the energy – and would be a stronger candidate. Republicans think they have a good chance of picking up retiring moderate Sen. Ed DeGrange’s seat. Wrong. Clinton carried the district by 12 and it’s not going to happen barring a massive sea change in the political environment. Del. Pam Beidle is a very strong candidate and will win. Republicans are spinning their wheels here. There are four seats where Democrats hope to play but will likely fall short. Sen. Gail Bates is the most vulnerable Republican but still holds a seat Trump won by nearly 8. The Carroll County portion of her district will likely save her from going down to defeat, as Howard includes less favorable territory even if it is by far the more Republican portion of the county. Democrats have nevertheless recruited a strong candidate in Katie Hester ready to take advantage of any wave. For Democrats, this was a real heartbreaker race in 2014 as Del. John Olszewski, Jr., known to one and all as Johnny O, lost by less than 3% to now Sen. Johnny Ray Salling. Democrats think that Salling didn’t so much win as became the accidental senator due to the hellacious political climate. Though Salling is seen as a lightweight who doesn’t work hard in office or at fundraising – he has just $30K in his campaign account – this was territory Trump carried by 15 points that shifted GOP across the board in 2014 and 2016. Democrats have recruited a local activist and electrician, Bud Staigerwald, who fits the district well and is strongly backed by Comptroller Peter Franchot. Staigerwald lost a primary for Council District 7 in 2014. Sen. Bob Cassilly represents the more Democratic turf in Harford but it’s still Republican and went for Trump by 11 points. Del. Mary-Dulany James, a strong and well-funded candidate, lost by 14.5% to now Sen. Bob Cassilly. Democrats think that they can take Casilly this time around but it will remain tough. Their ability to take advantage of opportunity will improve substantially if the locally deep-rooted James runs again. After a long hiatus, 7S is resuming its rating of legislative races for the 2018 election. Previous posts covered Safe Democratic, Safe Republican, and Lean Republican seats. All four Likely Republican seats are outside shots for the Democrats. But if the anti-Trump whirlwind hits Maryland in 2018 and sweeps away Republicans, here is where it is likely to strike. Democrats need strong candidates here in order to be prepared to take advantage and to put the Republican on defense. Del. Folden won election in 2014 from District 3B, a singleton subdistrict of fiercely contested Frederick County D3. More Republican than 3A, Hogan carried 3B by 28 points in 2014 and Trump beat Clinton by 6 in 2016. However, Folden’s 56% victory margin lagged far behind the more popular Hogan. While Hogan will undoubtedly carry this area again, the question remains of by how much. Frederick continues to trend Democratic, which doesn’t help Folden either. Democrats were demoralized and did badly in the 2014 midterm election but the reverse situation could be Folden’s undoing. One can well imagine a scenario in which Trump continues to perform below expectations, weakening Republican support and turnout in contrast to angry Democrats. Notice that the same swing needed for Clinton to have won the district in 2016 would also ejected Folden in 2014. Del. Joe Cluster was appointed in 2016 to fill the seat won by his father, John Cluster. Del. Christian Miele was newly elected to the House in 2014. Miele and John Cluster won that election in Baltimore County’s District 8 with the equivalent of around 58% of the vote. Unusually, they share their three delegate district with a Democrat, Del. Eric Bromwell, who is also the son of a former legislator. Bromwell trailed his Republican seatmates with the equivalent of just 50.1%–about 5% ahead of the third Republican–in an area of Baltimore County that has been seen as moving Republican. Bromwell’s shaky hold despite his long experience in the House combined with Hogan’s 36 point victory ought to indicate that the Republicans should be fine. But Trump lost the district by 1% to Hillary Clinton in 2016 and notice that the Republicans significantly underperformed compared to Hogan. While Hogan is on the ballot, Trump is now President. Instead of riding an anti-Democratic wave, Cluster and Miele will have to contend with anti-Trump sentiment. Candidates in both parties always have to run hard here. Though well positioned, Cluster and Miele will likely have to run harder in 2018, as this is the sort of territory in which Trump’s unpopularity upset the increasing comfort felt by Republicans. Like Cluster and Miele, second-term Harford Del. Glen Glass holds one of the rare multimember districts split between the two parties. In 2014, he won with 57%, ahead of the 53% won by newcomer Democratic Del. Mary Ann Lisanti and the 48% gained by his losing Republican ticket mate. Harford County has been a growing Republican suburb but Democrats have nonetheless managed to retain a foothold in two-member District 34A. Before Lisanti, Mary Dulany James did well in delegate elections despite losing the senatorial election in larger D34 in 2014. Like Baltimore County’s D8, D34A went for Hogan in 2014 but then narrowly for Clinton in 2016. But this subdistrict is less strongly Republican. Hogan won by 28 and Clinton won by 2. The anti-Democratic winds blowing in 2014 that undermined Del. James’ senate bid won’t be blowing in 2018. Glass remains the favorite but, like D8, this is one of those districts that candidates from neither party can take for granted. If voters in Maryland’s outer suburbs turn on Republicans in a backlash against Trump, his reelection fight could be much tougher than anticipated, particularly if the Democrats find a good candidate. Good news. After a weekend off, the early vote bounced back to the second highest yet with 40,081–1.1% of all eligible voters–casting early votes on Monday. A total of 157,884, or 4.3% of all eligible voters, have cast ballots so far. Additionally, 22.297, or 0.6% of all eligible voters, have returned absentee ballots. The increase in early vote numbers is helpful to Democrats. If 40,000 people turn out each of the next three days, the total number of early voters will rise by around 58,000 over 2010. As Democrats comprise a disproportionate share of registered voters, the increase will likely result in an bump up for the raw votes banked by Democrats. 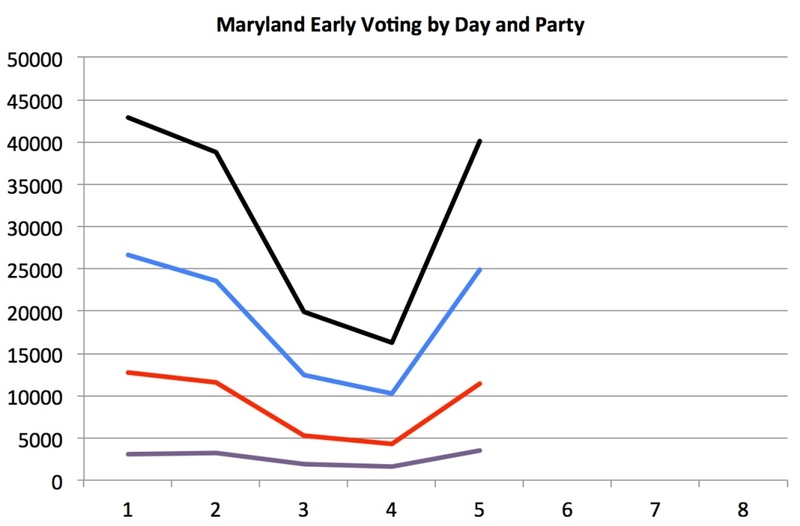 Even though Democrats seem to have lost most of their early vote turnout advantage from 2010, they still have a good shot at increasing the total votes won through early voting. Today’s table includes absentee ballots as well as early votes, so the rankings are not strictly comparable to yesterday’s table. However, the incorporation of absentee votes does not alter the overall picture greatly. 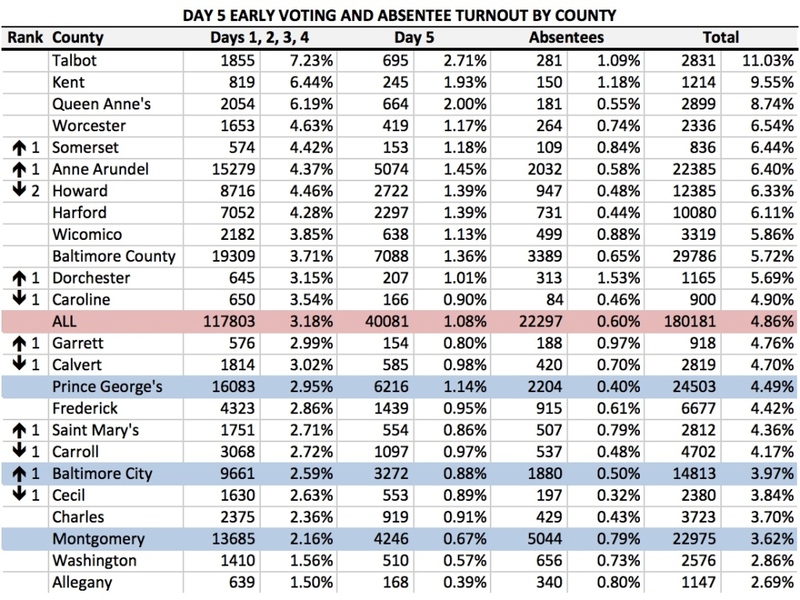 The number of absentee voters is smaller than it used to be thanks to early voting. The number of registered Democrats (97,777) who have voted early far exceeds the number of registered Republican (45,219) or unaffiliated (13,341) who have cast early ballots. The percentage of registered Democrats edged further above that of Republicans but only by an infinitesimal amount as the gap is now 0.04%. Republicans and unaffiliated are approaching their 2010 early vote totals at a faster rate than Democrats. While the number of early Democratic voters is 69.7% of their 2010 total voters, Republicans have already reached 77.3% with unaffiliated at 72.8%. So even though Democrats may benefit from the increase number of voters, as explained above, the closure of the gap with Republicans suggests that they will benefit less than they might and certainly less than they hoped. The poor performance in Montgomery remains especially disappointing to Team Blue, although it is performing better with absentee than early voting. Both parties seem to be turning out voters at a higher rate in their base counties. Consider that the rate of registered Democratic turnout exceeds that of Republicans by 1.89% in Baltimore City, 1.46% in Prince George’s, 1.26% in Howard, 1.01% in Montgomery, and 0.39% in Charles. On the other hand, registered Republican turnout exceeds that of Democrats by 1.97% in Talbot, 1.10% in Worcester, 1.10% in Wicomico, 0.56% in Queen Anne’s, 0.46% in Garrett, and 0.45% in Harford. Democrats form a majority of early voters in D3 (Young), D6 (Olszewski v. Salling), D8 (Klausmeier), D12 (Kasemeyer), D30 (Astle), and D42 (Brochin). The numbers are most dangerous for incumbent Democrats in D29 (Dyson) and D38 (Mathias). In these two districts, more registered Republicans have voted than registered Democrats. In D9 (Frederic v. Bates) and D34 (James v. Cassilly), the numbers are in between–Democrats are a plurality but not a majority. Del. Mary-Dulany James is probably stronger in D34 because of her long history representing this swing territory and appealing to unaffiliated voters. Del. Gail Bates likely has the edge in D9 for similar reasons. 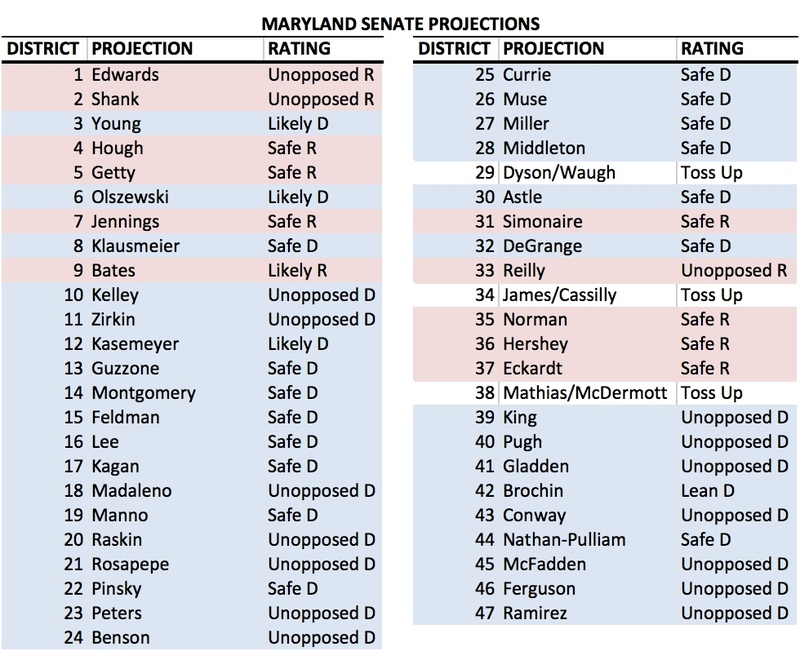 Looking over this year’s Senate races in Maryland reveals no threat to Democratic dominance. Republicans have no chance of even winning enough Senate seats to sustain a gubernatorial veto should Republican Nominee Hogan upset Lt. Gov. Anthony Brown. The Democrats start with a built-in advantage with the 20 safe districts located in the big three Democratic counties of Montgomery (D15-20, D39), Prince George’s (D21-6, D47) and Baltimore City (D40-41, D43, D45-6). Add in the extremely safe seats in Baltimore County (D10 and D44), Charles (D28), and Howard (D13), and the Democrats reach a majority without breaking a sweat. However, the Democratic advantage extends beyond structural. The Democrats demonstrate an ability to fight hard and win seats on Republican turf. Republicans don’t exhibit the same ability, which is why virtually all of the toss-up races are seats that Republicans should win but might not due to the strength of Democratic candidacies and support for them. Incumbent Sen. Jim Mathias has a real fight on his hands to hold District 38 due to a challenge by Del. Mike McDermott in a race profiled earlier this year. Based on the district’s strong Republican lean, Mathias ought to lose but this former OC mayor is a born campaigner and has a huge financial advantage. Roy Dyson has a resilience rare in politics, holding this seat since 1994 after losing his congressional seat in 1990 following a scandal that attracted national attention. Due to an increased naval presence, St. Mary’s Republican lean keeps getting stronger–Romney won 58% of the major-party vote–which leaves Dyson’s hold on it more precarious. Conservative Democrat Dyson has his hands full in his rematch against Steve Waugh, who came within 3 points of taking District 29 in 2010. Sen. Nancy Jacobs (R) has decided to retire and Democrats have high hopes of taking this Harford County seat. Democrats did their best to carve out as Democratic district as possible in south Harford though District 34 still remains Republican territory. But Del. Mary-Dulany James has won elections here since 1998. She campaigns hard and is better funded than former Bel Air Mayor and Harford Councilmember Bob Cassilly. Sen. Jim Brochin has far more money than his Republican opponent, Tim Robinson, and is an indefatigable campaigner. I would rate the district Likely D except that Brochin has a lot of new Republican territory in this reshaped version of District 42. Still, he could be in trouble if a Republican wave hits hard here. Dutch Ruppersberger is 68 so it’s possible he could choose to retire relatively soon. D2 is a bizarre gerrymander takes in few legislative districts in their entirety. However, it does take in all of District 6, which would position soon-to-be Sen. Johnny Olszewski well for a bid (or perhaps Delegate Eric Bromwell). While the Second does take in bits of Baltimore City, Howard and Anne Arundel Counties – none of them comprise a large enough portion of district to provide an effective base of support. I believe that any successful candidate would have to hail from Baltimore County. I can’t tell based on a map of the 2nd district whether Senator Ed DeGrange overlaps at all in Northern Anne Arundel County. If he does, it’d likely be worth his taking a shot at this. The Second District also includes a truly substantial portion of conservative Harford County. I believe there isn’t a large enough base of Democratic primary voters for a viable Harford based candidate to emerge. Former Mike Miller aide Pat Murray would nonetheless have been an interesting candidate if he hadn’t lost the primary in his bid for Delegate in this right-wing bastion. Delegate Mary-Dulany James–and now Democratic senatorial nominee–might be a viable Harford candidate but I think she’s to far to the right of his D+7 district. State Secretary of Transportation and former Baltimore County Executive Jim Smith lives in Cockeysville, which is split between MD-01, MD-03 and MD-02. He could likely raise well over $1 million dollars for a bid here. Secretary Smith is in his mid seventies though and I doubt he’d have the appetite. Former Investment Banker and 2002 Candidate Oz Bengur might decide that the field is weak and take a crack at it. Links to Part I, Part II, Part III, Part IV, and Part V of this series on top Senate primaries. Sen. Nancy Jacobs (R) is stepping down, so District 34 is an open seat. The Democratic primary features Del. Mary-Dulany James, who has served four terms, against former Sen. Art Helton, who served two terms from 1975-83. He also served for two years on the Harford County Council before entering the Senate. Helton sought to regain his Senate seat in 2002 but incumbent Sen. Nancy Jacobs beat him with 60% of the vote. He challenged Jacobs one more time in 2010 but she won again with 56%, though Helton narrowly carried the Harford portion of the district. His 2014 bid nearly came to an early end when the Board of Elections found he did not reside in District 34. However, they reversed their decision. Similar issues arose during Helton’s 2010 race. James comes from a political family. Her father, William James, served in the General Assembly for three decades, including as Senate President from 1963-74. After he left the Senate, James served three terms as State Treasurer. The James Senate Office Building in Annapolis is named after him. James and Helton were nearly evenly matched in campaign funds at the beginning of the year with $50K for James and $48K for Helton. But while James raised $84K, Helton raised less than $1K and loaned his campaign $60K. His campaign finance entity owes him $297K in loans. I suspect slates matter less here than in other parts of the State because Harford Democrats have a strong incentive to develop a personal brand due to the County’s Republican lean. James has come in a very strong first in all four Democratic primaries for delegate, winning almost every possible vote after the first. It is hard to see how Helton competes with this level of electoral strength. Moreover, James has shown a consistent willingness to work hard to keep a firm hold on a tough delegate seat. Her fundraising ability also indicates a depth of support even if she may well envy Helton’s ability to self finance. Moreover, she has Senate President Mike Miller on her side. Redistricting greatly altered District 34. 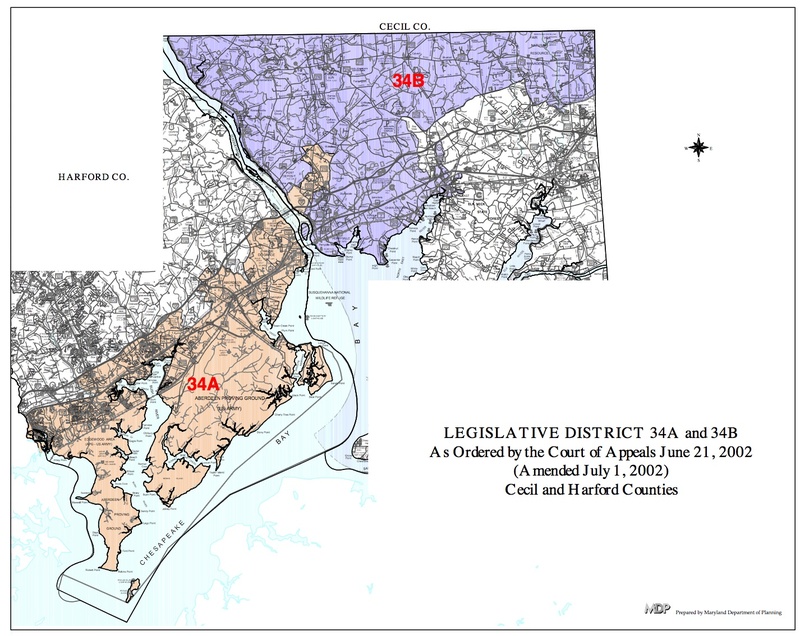 Previously, District 34A included south Harford and a tiny piece of Cecil around Manor Heights, and District 34B was north Cecil (see below). The new District 34 (see above) no longer includes any portion of Cecil. 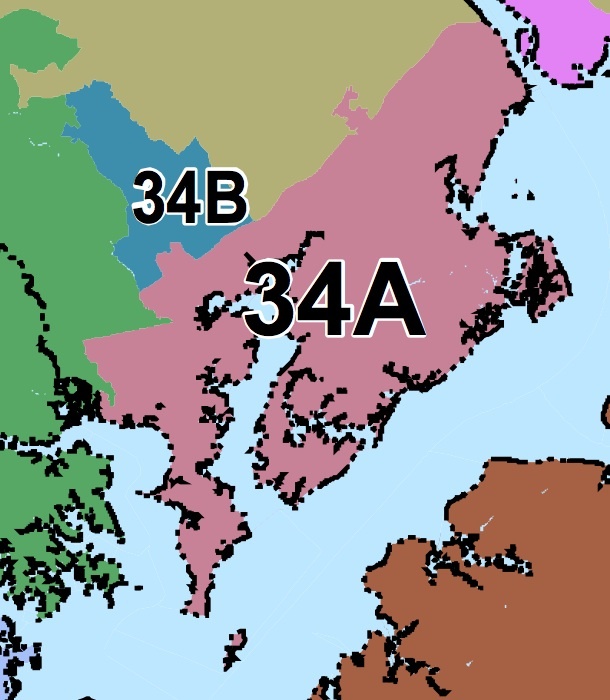 Instead, it pairs most of 34A with former District 35B centered on Bel Air in Harford County. The new district has roughly the same partisan balance as the old district. The old District 34A has a slight Republican lean–O’Malley and Ehrlich were in a virtual tie though O’Malley won handily statewide. The old District 34B and District 35B were both carried by Ehrlich over O’Malley by roughly 2-1. So the overall district has a Republican lean but is as Democratic as possible in Harford. Whoever wins the Democratic primary will still have to fight hard to win the general election. Republican Bob Cassilly is a former Bel Air Mayor and Harford County Councilman who left office in 2006 when called up to serve in Iraq. However, Cassilly has only $15K in his campaign account–not a sign that the Republicans feel encouraged about the race despite the district’s Republican tilt. It also seems telling that the two Republican delegates filed for reelection rather than for the Senate. James’ electoral record likely intimidates. In her first general election in 1998, she came in first. In 2002, James came in a close second even as the other Democratic incumbent went down to defeat. She easily outdistanced the rest of the field in both 2006 and 2010. Her willingness to work hard for votes no doubt helps–she claims to have knocked on over 10,000 doors already.